Speedy supper tonight. 4 left over chicken thighs, cut into thin strips, 3 red pepper halves that had been marinated the previous day with olive oil, garlic, baby tomatoes and basil for a light lunch and had been thankfully left over – cut into strips too and pan fried with two spring onions sliced thinly. Once they had attained a sparkly, gleaming brightness, I pushed them to one side of the pan and added the chicken and pan fried it until it was browning a little. I then stirred it all together and added some fresh coriander. This was now in a state of extreme bliss. 5 or 6 Majorcan new potatoes were sliced thinly – not peeled – and pan fried in hot olive oil with a generous sprinkling of cumin and rock salt. Just as the chicken was about to be served I ground over some lemon thyme salt. I added a portion of the chicken pepper mix to a wrap, plus some of the fabulous juices along with a few baby salad leaves and some cumin crisps on the side. P.S. Dear Mr Jagger – if you still cannot get any of the aforementioned abstract noun – please try these wraps. 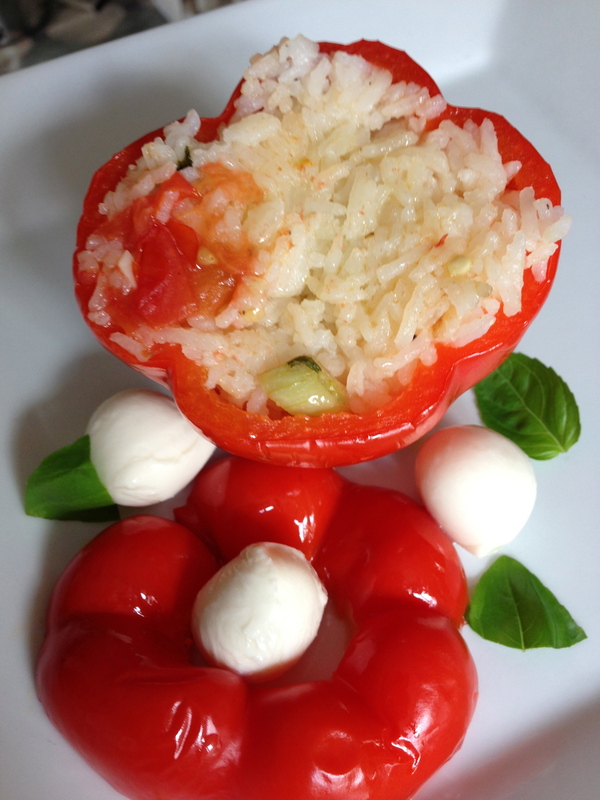 Simple dish – I am sure it is not new to any of you but it is one of our family stand by quick suppers. I love it. They love it . We all love it! Barnsley, butterfly or saddle – take your pick! 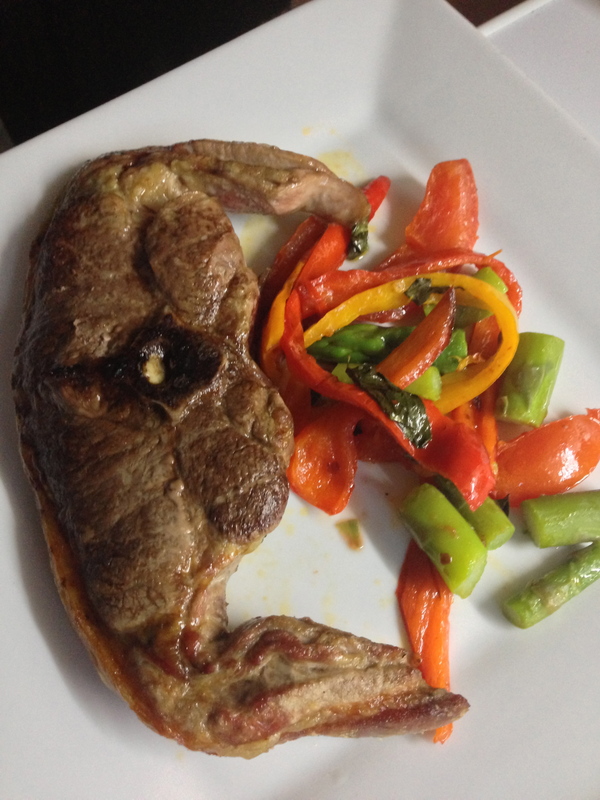 I bought 4 fabulous chops from Parsonage Farm recently – and they were awesome. They go under any of the above names – I always call them Barnsley Chops. Barnsley is a town in South Yorkshire and the name seems to have come fro there in the mid 1930s – there are several versions of the story. Not especially exciting enough to recount here though! In the butchery trade, Barnsley chop has come to mean a chop around 2cm or one bone thick, cut across the whole loin in a butterfly shape. They are a serious piece of meat – and the art is not to overcook them. I grilled them on a high heat for about three minutes a side – leaving them nicely crispy on the outside but juicy and a little pink inside. They need little adornment. I pan fried long strips of yellow and red peppers, a finely sliced red chilli and a finely chopped clove of garlic in olive oil with a little black pepper and salt. Then I tossed in for the last three minutes or so some steamed asparagus cut into three inch strips. Chops are the ultimate fast food. Indeed they emerged in the 17th century in London, served up to busy city dwellers, as a sort of forerunner of the hamburger, in places known as chophouses from the late 1690s on. Any meat containing a bone and ‘chopped’ from the loin, shoulder or the ribs was a referred to as a ‘chop’. And it was either mutton or lamb – bits of beef being too big to walk round with I guess! Though Samuel Pepys in his diary in 1663 refers to him having ‘had a chop of veal’ one lunchtime. There are some horribly mangled looking things masquerading as lamb chops in supermarkets – but go to a good butcher or a farm shop- and experience the real thing – and try one of these saddle chops – or whatever you want to call them! They are lusciously, mouth-wateringly, filling. One of those very, very lazy days – gardening, playing with the cat (that’s our Pip above..as you can see being very helpful in the garden! ), cooking, snoozing now and then, reading the papers and sipping rosé all day with Van Morrison mumbling love songs on the cd player…hmmm.. a wonderful mellow day to be alive. Lunch was stuffed peppers with a fabulously simple tomato and onion salad from the marvellous French Brasserie Cookbook by Daniel Galmiche. If you haven’t got it – buy it…superb – a big thank you to Johnny Parker for recommending it! I pan fried some spring onions, a tomato deseeded and chopped, a clove of garlic and a finely slivered red chilli. I cooked some basmati rice,let it cool a little then aded it to the pan, with a little salt and pepper and some chopped coriander. I had deseeded and blanched the red peppers in boiling water for 5 minutes, then plunged them into a pan of cold water. I stuffed them with the rice mix, drizzled olive oil over them and whacked them in the oven 190c for 45 minutes – they could actually go in longer if you wish – pop some wetted grease proof paper over them if you cook them for longer. 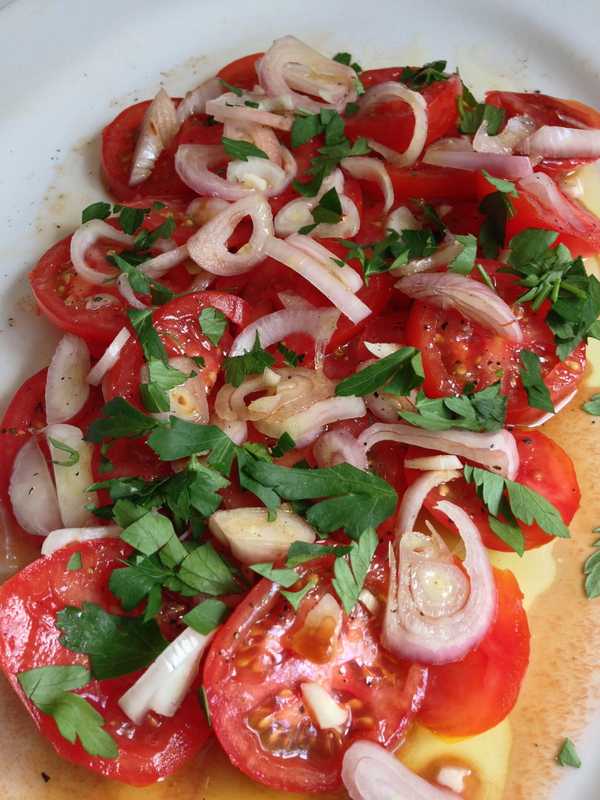 For the salad de tomate aux onions …arrange 5 or 6 sliced vine toms or the best you can get on a plate, finely slice a white onion – I used three shallots – or you could use the white of a salad onion- and sprinkle over the toms. Season with s & p. Drizzle with 4 tablespoons of good olive oil over them, then 2 tbsps of red wine vinegar and then 2 tbsps of balsamic vinegar. Finally finely chop a clove of garlic – swizzle over the top and a handful of chopped flat leaf parsley. 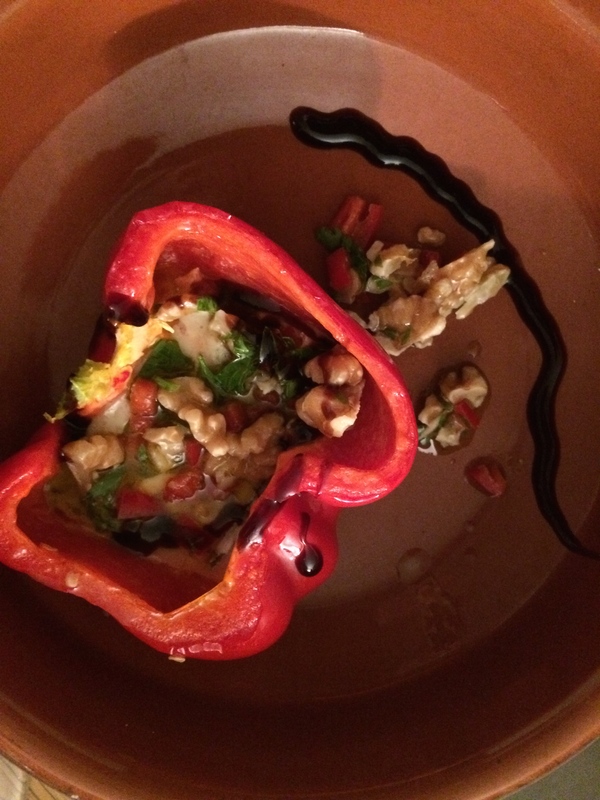 I ate this with a baguette – vital for mopping up the sensationally scintillating juices!